There are only 2 holidays during the year for me, Thanksgiving and Christmas and Thanksgiving is by far my favorite. 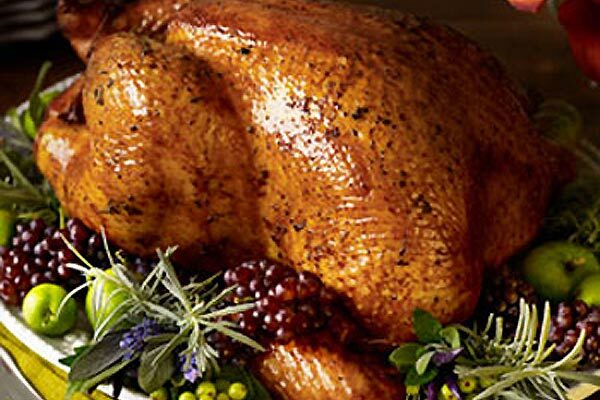 There is nothing as beautiful and heart warming as a Thanksgiving Turkey. Family and friends gathering for the sole purpose of being together and enjoy all that they share. Its the one day a year when it would be insulting to the cook, not to eat too much. 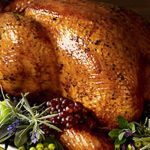 Between this page and Everything About Roast Turkey you will be able to manage a wonderful juicy bird. I took some care to write this in both European and American weights and measures and to be as clear as possible. Try my Sausage and Apple Stuffing which can be made vegetarian quite easily. This is a primer on how to roast a turkey. There isn't a lot of mystery just a little technique will get you great results. 1 Sausage and Apple Stuffing recipe. Preheat your oven set at 230°C or 450°F Do not use your convention fan if you have one. Wash the turkey well inside and out, dry well with paper towels. Prepare the breasts for filling with butter (see: Everything you need to know about Turkey!) Rub the outside of the bird with butter or a little oil, salt and pepper, sprinkle lightly with a little thyme if you like. Stuff with dressing (stuffing – an average turkey will take about 1 ½ liters or 1 ½ quarts of stuffing). Place bird in the hot oven and let roast for ½ hour then reduce the heat as recommended below depending on the size of the bird. After the first hour baste every 30 minutes with pan drippings and additional butter if you need more liquid as the turkey roasts to keep the breasts moist. ½ hour before the bird is ready remove all the pork fat from the bird and discard – this will help the skin brown, and baste it. The internal temp needs to reach 85°C or 180°F to 185°F. The internal temperature of the stuffing must reach 74°C or 165°F in order for it to be cooked well enough. Timing the cooking of a turkey for the layman is a real pain but the small investment of an electronic meat thermometer. If your oven has a built in thermometer that you can insert into the bird it will help a great deal. The internal temp needs to reach 85°C or 180°F to 185°F when you insert the meat thermometer into the bird’s inner thigh muscle - between the thigh and the bird’s breast, being careful not to touch the thigh bone. The internal temperature of the stuffing must reach 74°C or 165°F in order for it to be cooked well enough. Have ready oven mitts or towels ready. A large turkey can be an unyielding thing steaming hot out of the oven, not to mention really heavy. When the bird is done remove the pan from the oven and place on a kitchen counter that can take the heat of the pan. This is important and you mustn’t skip this step. Remove the bird to some extra wide and heavy aluminum foil and wrap the bird tightly in it. Place on a large plate breast side down and cover with a towel in a warm place. Let sit for ½ hour to 45 minutes. Take the roasting pan and drain off all the fat leaving behind any liquid that the bird gave off during the roasting. Place the roasting pan on the stove over a medium heat, pour in about a half a cup of white wine or stock and scrape up all the bits in the bottom of the pan (not anything that is actually burnt). When done, strain it through a fine sieve and it’s ready for making gravy. Any liquid that the bird gives off while it was resting can also be added to the gray stock.